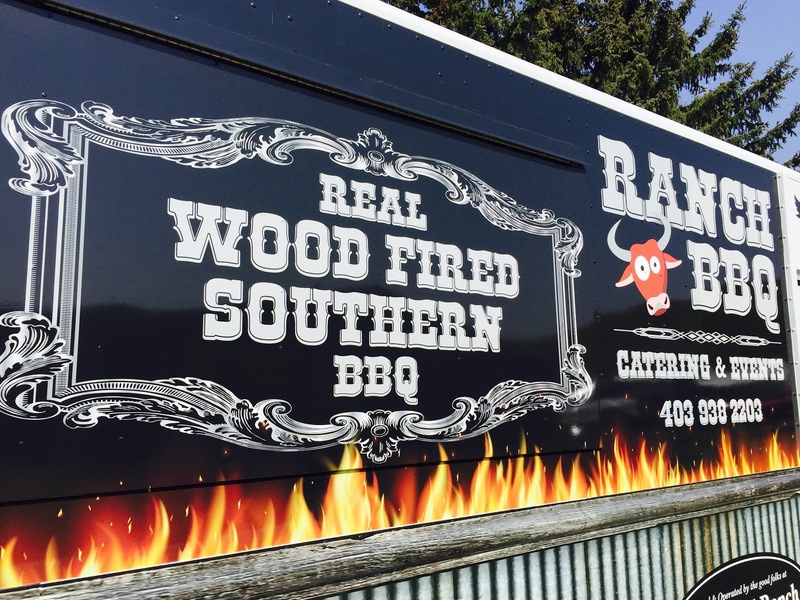 Real Southern Barbeque in Southern Alberta. 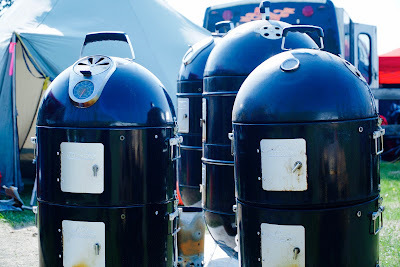 Lynwood Ranch, just South of Calgary hosted the first of three events for the Kansas City Barbeque Society's (KCBS) Alberta Cup Competition, 2016. It was one of three sanctioned events in Alberta that agreed to offer BBQ teams an extra chance at winning some special prizes with their smoked brisket, pork ribs, pulled pork and chicken. It all happened at Lynwood ranch on 14 and 15 May, 2016, and we were there. We, the Two Cowboys were ready to get on a plane to New Zealand for some prior commitments. But, we just couldn't pass on Gus' invitation to attend the event before the big day. There is no way we can leave without getting a taste of Alberta's legendary Barley fed pork at the BBQ Bash “Feast & Frolic”. This event preceded the competition the next day. 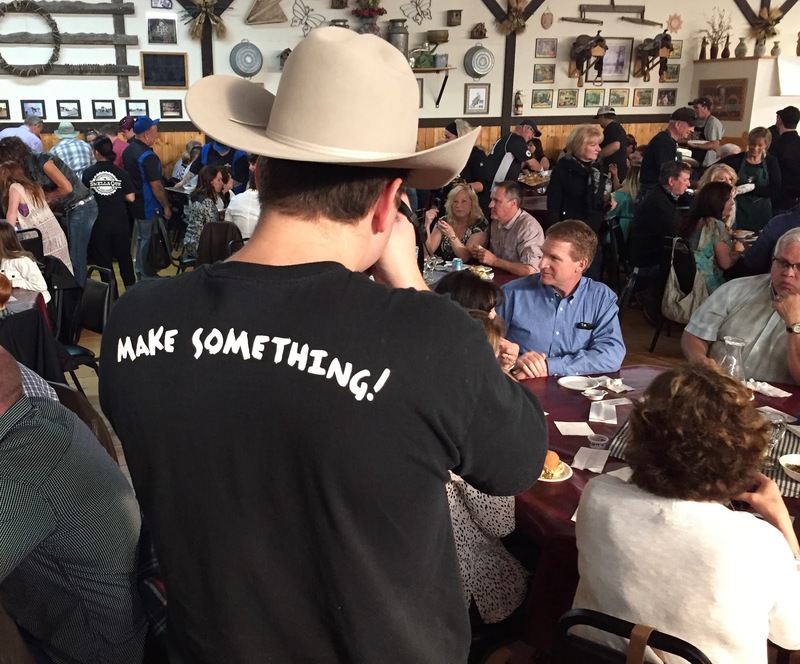 With the help of the BBQ teams that were competing, Lynwood Ranch put on an amazing feast for almost 300 people attending. I've learned one important thing from attending this amazing event: "This is serious business!" As born and raised South Africans we can probably write the book on barbecue. We "braai" at least three times a week since birth. However, nothing could prepare us for what we were to experience. The food flavours, sophistication and complexity we tasted could rival items from any menu in a five star restaurant establishment, anywhere in the world. Some of the meat smoking technology were space-age computer contraptions with minute tolerances and titanium precision. It was amazing to see the care and commitment that went into the most exquisite byte of flesh, jalapeño or burned-end. In contrast, the purists relied on perfect ingredients, traditional flavours, simple smokers and a lot of love and care for their art. The biggest impression on us was seeing how much fun people were having. It was a weekend family affair for the teams, and also for the spectators. 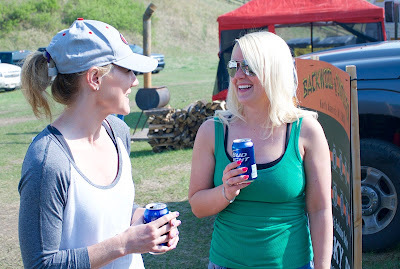 Folks travelled together, ate together and drank together. Everyone was made to feel welcome. Hopefully, this is the first of many instalments we get to bring you of Alberta's barbecue underworld. It is definitely something people should know more about. Lynwood Ranch is the place where you can lose your barbecue virginity. Gus and his team has a first class venue. He himself knows a thing or two about southern style barbecue. He is famous for his prime rib roast. Don't pass on an opportunity to taste one of the best. Gus, thank you for giving people a chance to cook great food. The Two Cowboys bring you Canada's Cowboy News Network (o-CNN). We support communities by covering real people, real events at real locations. You should see them!! Ben Gerwing is the third generation, and the most recent caretaker at the Alberta Boot Company. He grew up in the factory. As young entrepreneur he is equally at home with customers in the front of the shop, than he is at designing, or stitching a pair of soles on a custom pair. As typically happens with iconic producer businesses, the business is now much more than the Gerwing family. Like Smithbilt Hats, the company became an Albertan institution thanks to the Western traditions of the city and surrounds. 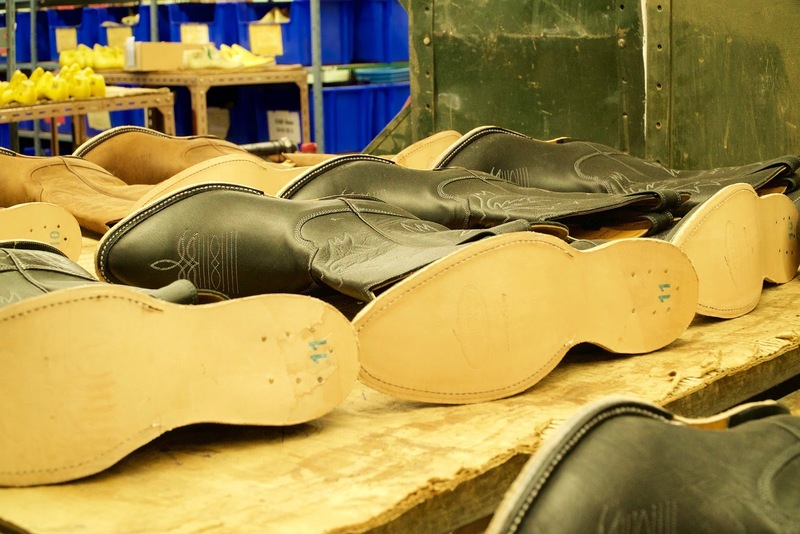 It is an icon for every Canadian Cowboy and for those that still appreciate old school hand crafted quality leather footwear. 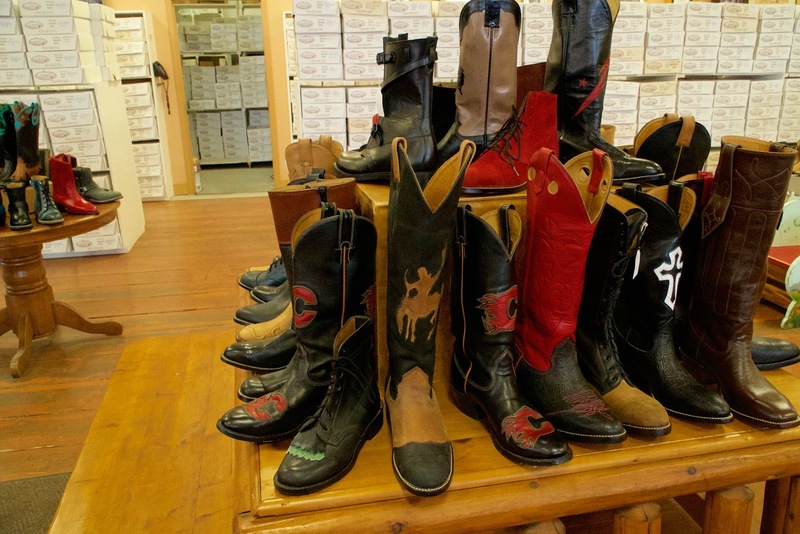 The RCMP shops at Alberta Boot Company for their boots. So does many other law enforcement agencies in North America. You can only get it at their store in Southern Calgary. You have to make the trip. Alberta Boot Company is now the only traditional leather boot manufacturer left in Western Canada, and one of the few businesses in its category that still make quality footwear that lasts. In Ben's own words: "When you buy a pair of Alberta Boots, you better like them. They are going to be with you for a very long time." There are good reasons why Cowboy boots look the way they do. They are workwear first, and has been for centuries. Ben has a real appreciation for the tradition in the category. However, it is some of his newer designs in leather shoes that caught our eyes. 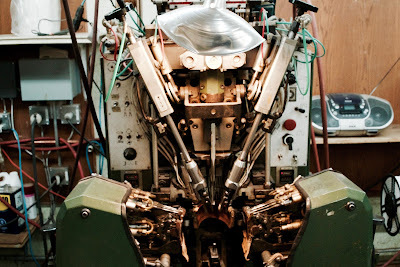 He is modestly hand crafting very stylish half boots and leather shoes for a newer market. You just have to go and see them for yourself to appreciate them. Alberta Boot was an idea that came from Clement Gerwing, Ben's grandfather, in the mid 1970's. He was selling western boots from Mexico and Quebec out of his wholesale footwear store. The demand for well made western boots was high and he didn't like the quality and products coming in. This was when he decided to start a new venture at an age many were considering retirement. 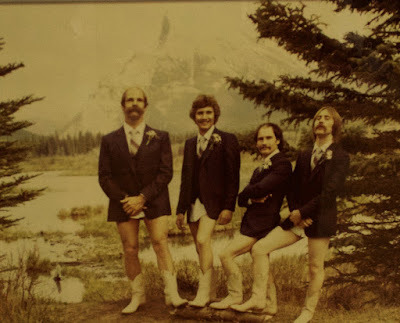 Over a course of two years, in 1978 Alberta Boots was ready to go. 35 years later, they still make all their boots the same way they did at the beginning, even using quite a few of the original machines to add to the allure and individuality of every pair of boots produced. Alberta Boot Company has outfitted Royalty, movie stars, entertainers, celebrities, athletes, public figures, religious leaders, and most importantly - ordinary people from all over the world who are intrigued by the mystique of the Wild West! "There is no greater compliment that we could receive," Ben Gerwing says, "than when a customer comes into our store and lays down their hard earned money for a pair of Alberta Boots. 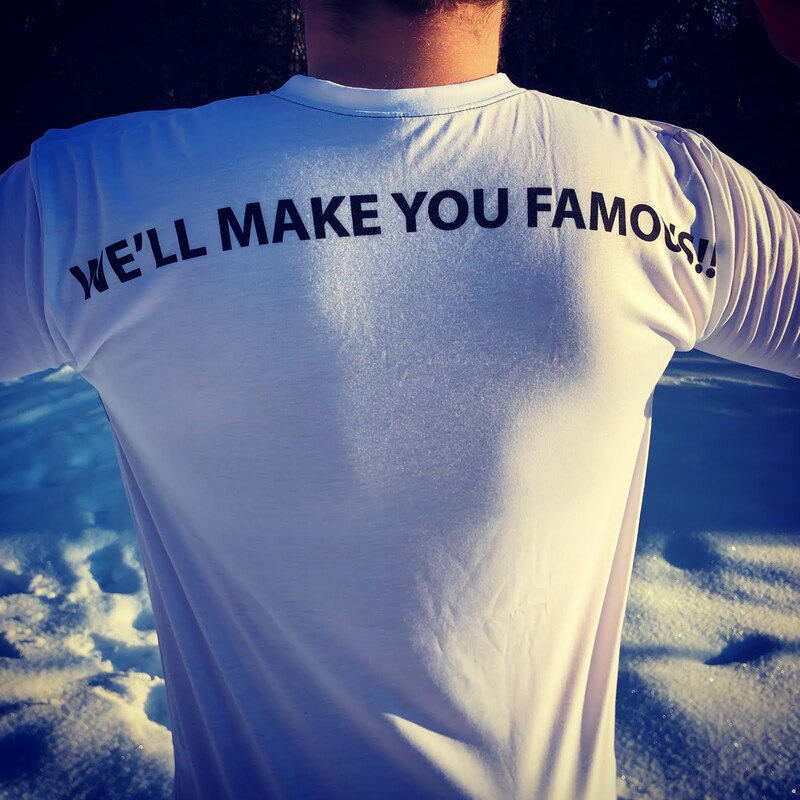 The fact that well-known people are wearing our product is an exciting thing, but it is the support of our regular clientele and the efforts of our dedicated staff that have brought our company to where it is today." 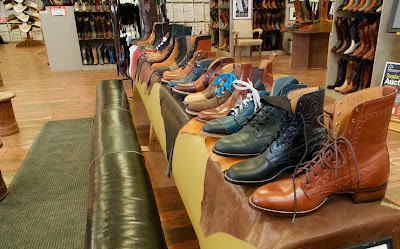 Unfortunately, there are not a lot of reasons to visit Albert Boot Company, often. The problem is that they make their boots so well that unless you are a collector, you have to invent reasons to visit. This is exactly what I do to have an excuse for a trip to Calgary for boot shopping. Every family member or friend that visit us in Alberta is carted off within the first week of their arrival for their first pair of boots. Real Cowboy Boots. Every sibling that reaches the ripe age of eighteen also gets their custom pair of Alberta Boots. Why eighteen? Because the boots are so well made, you better be sure they fit. You are going to fall in love with them and wear them a long, long time. It is easy to spot the people that wear Alberta Boots during the Calgary Stampede. They are the people with the smiles on their faces, because the boots are also really comfortable. The imported variety, that is taken out of the cupboard only for the once a year celebration, has a tendency to destroy your feet, and your love for the iconic western cultural celebration. A trusty boot is like all well made garments. It takes on the character of the person that wears it. Alberta Boots are no different. Once you made friends with a pair of bull hides, they are friends for life. One particular event stays with me from a prior visit to the store. An old cowboy came through the door with a pair of Alberta Boots in need of a lot of attention. After he was kindly informed that his boots were beyond resuscitation and repair this time, he just shrugged and left them on the counter. "I'll pick them up next week when you're done." he said in passing. On closer inspection, his boots has already been re-made several times, and apparently he is refusing to let go. 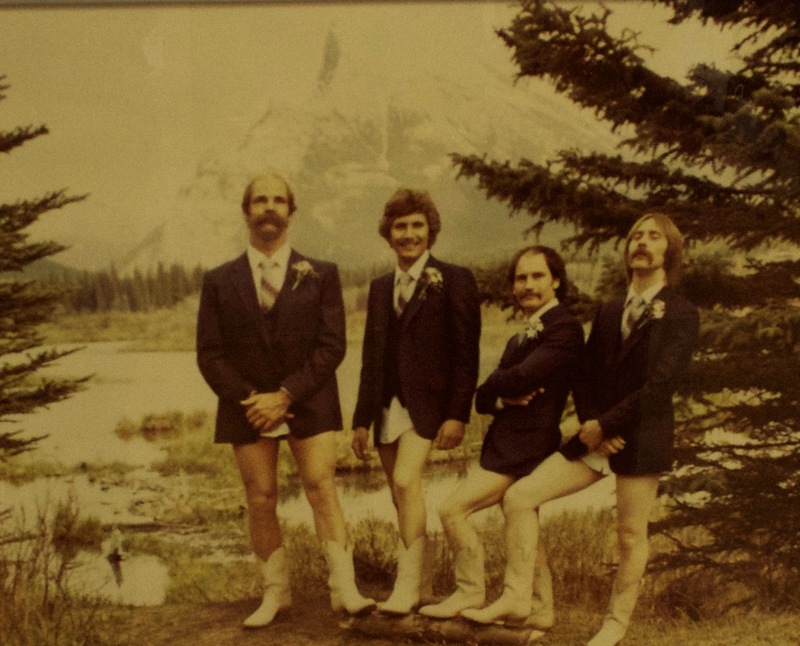 That made an impression on me about the loyalty to, and love affair people have with their Alberta Boots. If you ask me why I wear Alberta boots. Because an Alberta Boot ultimately becomes my boot. Ben and his team understand that very well. Many people's dream lifestyle is to have a little coffee shop in the mountains, somewhere beautiful. In Canmore, Alberta we are in the mountains where it is beautiful. We have a lot of coffee shops. People are living their dream, for sure. The coffee is here, but is it any good? Ten years ago, you probably would have had to drive over the border (to B.C. or way further South) to get a decent Italian coffee. 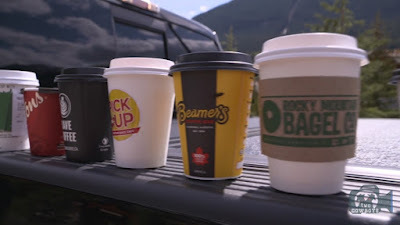 Today, our little mountain town boasts two established, popular and recognized coffee roasters: Rave Coffee and Mountain Blends, and many coffee serving establishments. If that isn't enough, Calgary has seen some amazing roasting and coffee evolution of its own, over the last two decades. The likes of Fratello, Phil and Sebastian, Priddis' Crickle Creek Coffee and others are all working to raise the bar in prairie coffee. 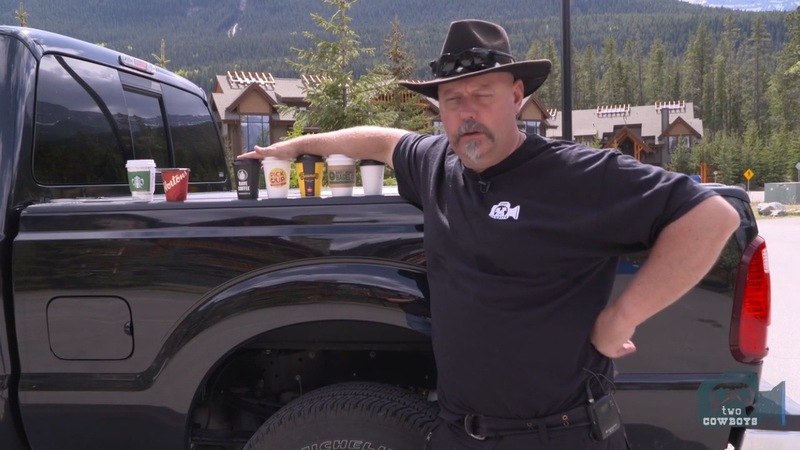 "What is the state and standard of coffee in Canmore?" We don't think we've settled the question yet, and you should stay tuned for further instalments. Calgary Coffee establishments be warned, we are coming your way too. A coffee connoisseur once noted that everybody in the coffee value chain can do their jobs perfectly. The right plants can grow at just the right place. The plants can get just the right weather to produce the perfect berries. A willing farmer and his family can lovingly treasure, work and harvest their crop. They can pick it at the right time, ferment, dry and sort the beans by hand in the blazing hot summer sun. Then, they can send their beans thousands of miles to destinations they've never heard of, or will ever see. The beans can then be roasted with computer precision and timing for the ultimate perfect aromas to be unleashed. With years of experience, expertise and a sophisticated palate, the roaster can then blend it for the perfect delivery of the very best shot. And then it takes something as simple as a 21 year old hipster barista to fek&^% it all up in 2 minutes. Many not knowing their cappuccino from their macchiato, when it comes to making a good cup of coffee. Let's just say: "Canmore, the majority of your Baristas need some help." There are a few outstanding one's around (with Kiwi or Ozzie accents). The rest need a hand. Here is an idea: We are offering to send them to Barista school. 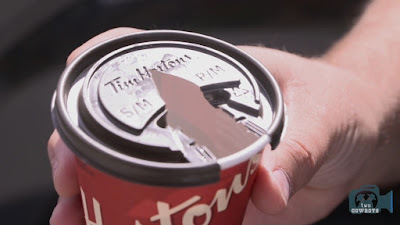 We volunteer to launch a training trust fund for Barista's in Canmore. Let us know in the comments below if you are keen to get involved. The second observation relates to the other half of a good coffee: The milk. Starbucks succeeded in making aspiring "expert" coffee mixologists of everyone that can plonk down a loyalty card for their next "Venti Skinny Soy Caramel Macchiato with Double Whipped Cream and Two Extra Decaf Shots To Go". However, a real coffee comes with silky caramelly, rich and creamy milk. Granted, this is something which is in general short supply in deconstructed and reconstituted, homogenized and pasteurized chalky white water Canada. We are pleading with our coffee shop owners to pay particular attention to the milk they use. Yes, we know customers have preferences, but that is probably because they simply don't know any better. If it was up to us, every coffee would be made with Half & Half or something even richer. This is why New Zealand (the land of the many dairy cows) is so committed to their coffee. It comes with great milk! 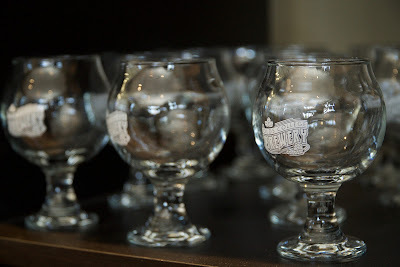 When we heard "beer school", we conjured up visions of heavenly aromas, rivers of golden beer, and perfectly valid excuses for consistent intoxication, thanks to an above the norm commitment to beverage quality control. 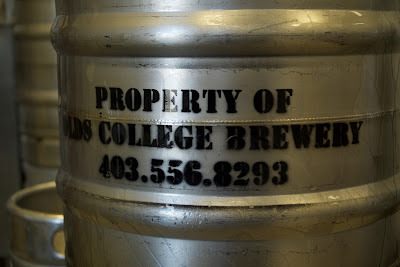 What we found at Olds College Brewery instead, is a serious business. 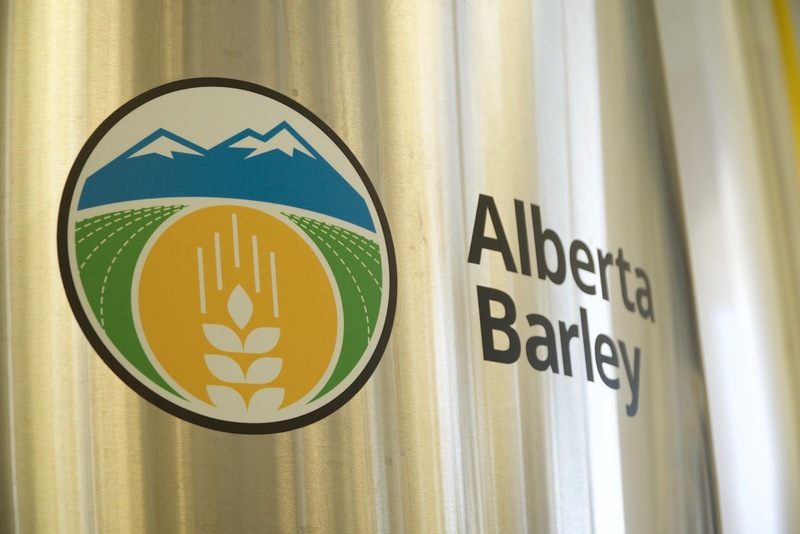 The brewing industry in Alberta and Canada is growing rapidly. It took nearly a hundred years for the impact of prohibition and subsequent corporately sponsored government control of the beer and distilling industries to loosen its grip on enterprising brewers and distilling craft lovers. We are now finally seeing increasing numbers of craft breweries and distilleries, driven largely by strong consumer demand for a greater variety of great tasting, and local craft beers and spirits. Canada is slowly waking up to the realization that we can all have our own beer. 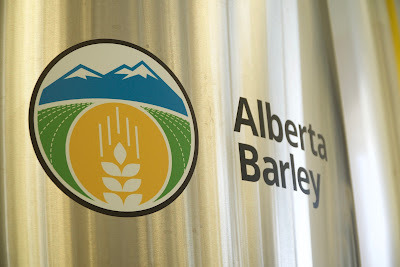 Alberta has the ingredients, the entrepreneurial spirit, and if you go back far enough, the foundational history in alcohol production. It is time we embrace our agricultural assets and our heritage. Peter Johnston-Berresford is the leading Brewmaster at Olds College Brewery, and a pioneer of Alberta's very own Brewmaster and Brewery Operations Management Program. In his words: "Every community and town in our Province has the capacity to support its very own small community based brewery." Olds College is playing its part in ensuring this becomes a reality. The College has a hundred plus year history in education that supports the agriculture and agriculture value-added sectors. 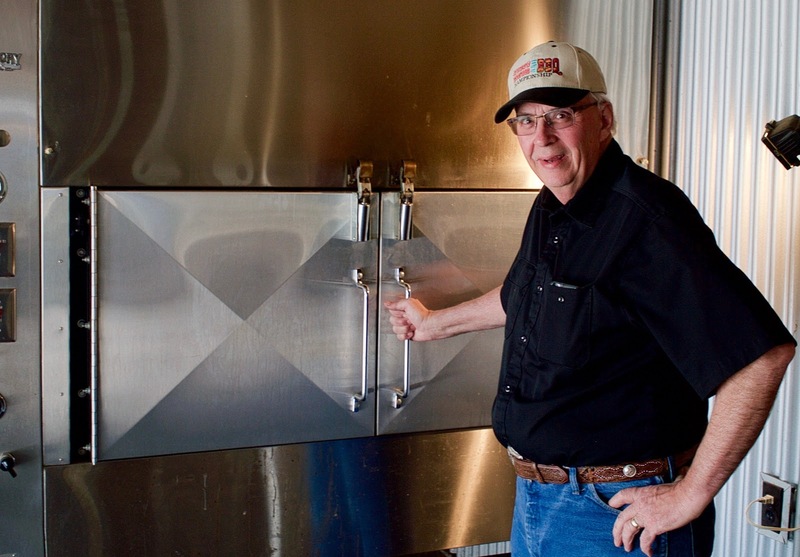 The idea of starting up a teaching brewery was seen by their board as a perfect fit to some of the core agriculture production in the Province. 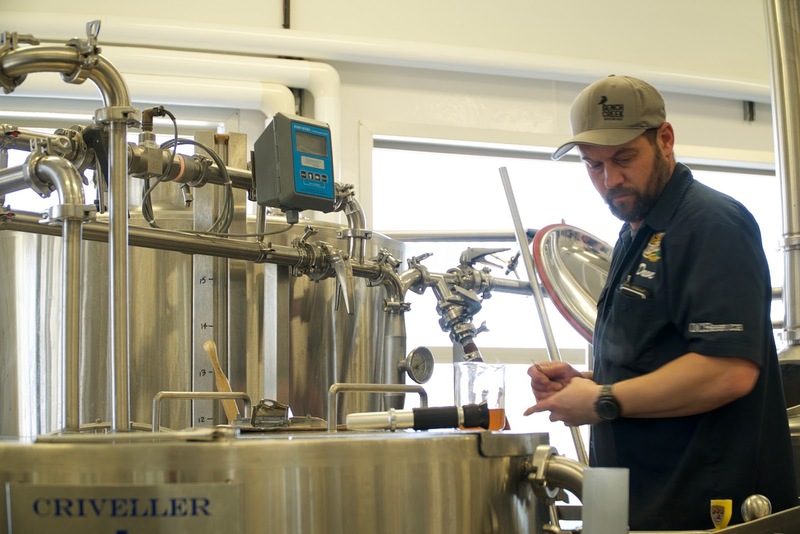 They created a state of the art 2,000 square foot facility dedicated to teaching students the art and science behind brewing the best beer possible. Their first student intake was in the fall of 2013, and they began to produce their first commercial brews in January 2014. The fundamentals of beer making and brewery operation. Performing laboratory analysis of beer as required in a brewery. Formulating and developing beer recipes for the marketplace. As you can see, this is serious stuff. 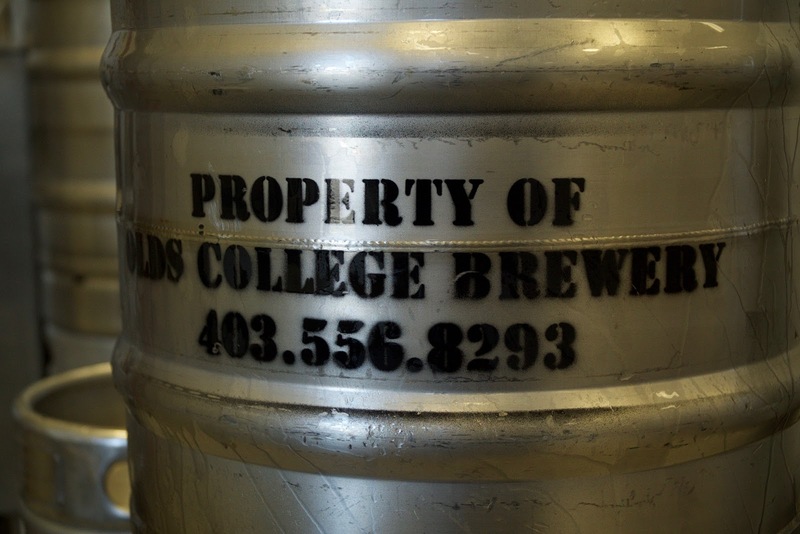 The magic of the Olds College program is that it is not all about beer. It is also about the business of beer. Students are inducted into the finer points of brewing commerce and production. This prepares them to be good brewers, good entrepreneurs, an asset to existing industry players and above all, good community members. The proof is in the beverage! There is no room for hops-trigger-happy-hipsters in this operation. Everything we tasted was delicious, well balanced and full of character. The beer is simply outstanding. Every Producer knows that you have to start with a good product to succeed in business. 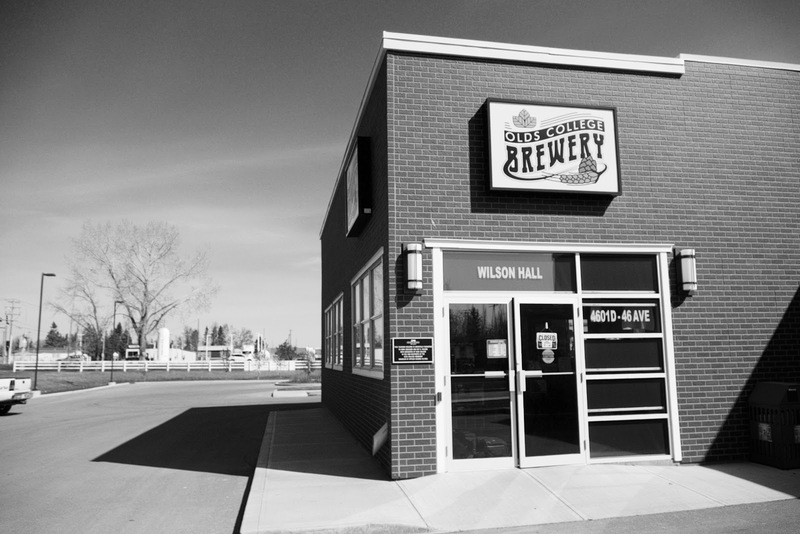 The Olds College Producer took on the added responsibility of not only having a good beer, and an outstandingly well qualified candidate for the industry, but it set itself the target of being self-sufficient. We applaud them for this free-market spirit! The Brewery is a commercial operation. It may be dismissed by some sceptics to be a novel idea, until you realize that what they turn out is high quality stuff. It is well worth the trip to Olds to stock up on their beer. Who knows, it may even become serious competition for the bigger brands in due course. As we've exclaimed at the end of the video. This is now also "our beer". Peter, Tony and David, are doing fine work. It is awesome to see the core values of production and commerce alive and well at an institution that are preparing future generations for their place in society. Not only do they teach the values. The institution lives by it. We are proud to have the opportunity to tell their story. We hope to have many more excuses to continue to share their success and work beyond Olds, and beyond their beer. We are having a cold on on them! Peter Worden is the Nanton Experiment Editor-in-Chief, publisher, reporter and in charge of general office morale (office of one, as far as we can tell). 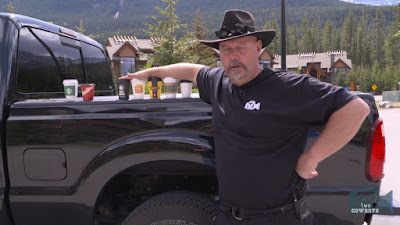 We caught up with him in Revelstoke B.C. This is his winter hideout, where he shelters from the biting icy Nanton prairie winds. There could also be a woman involved, but we didn't dare to ask, and saw nothing. Peter shares our Cowboy News Network opinion that a whole lot of local community news is going missing, because our media in small-town Canada is no longer "local media". Most of the newspapers and radio stations in our towns and cities are owned and operated by large out-of-town media conglomerates. They are too much profit and circulation driven, and hence miss the truly valuable and inspiring stories of the people in the community. To fill the void, he struck on an innovative idea to go tiny, in a tiny town. He publishes the Nanton Experiment, which claims to be Canada's biggest tiny newspaper. More recently he also took on the responsibilities for the Reved, which covers arts, adventure and all things awesome in Revelstoke. In line with his recent success with the Nanton Experiment, the Reved now also boasts a "Quarter, 1/4'ly". The headline for this quarter is a downtown marriage ceremony slated for 22 May, to which "...the whole world is invited". The tiny newspaper comes complete with instructions on how to make Revelstoke the eloping mecca for people on a budget. We asked Peter if there is enough news to cover in these small towns. He assured us that the beauty of his endeavour is that, as with most news in small towns, it has a tendency to grow and get more interesting with time. "Stories get bigger, and before you know it, you can skate (publish) with the rest of the more mainstream and national media, by make things up as you go. We plan to catch-up with Peter again later in summer. His efforts are definitely putting the spotlight on our communities, and we are eager to contribute in our way to his mission. In the mean time, enjoy the introduction in this post and video. What will you do if you lose your business of thirty years, your recipes, your trademarks and even the right to use your own name? You do what you've always done. Passionately, you start again and make the things you love. Every time you work on it, you strive to make it even better! With a name such as Callebaut, one cannot help but have chocolate in your veins. Chocolaterie Callebut’ was established in 1911 by Octaaf Callebaut in the small Belgian village of Wieze. His chocolate company took up the same factory building his grandfather Eugène Callebaut, which was founded as a family-run brewing and milling company called ‘De Ploeg’ in 1850. Not far from this location, young Bernard grew up into a world of chocolate. Bernard wanted to explore the world, and Calgary benefitted as a result. The far west of Canada was introduced to the finer art of flavour when he fell in love with the mountains and the prairie. Here at the foothills of the Rocky Mountains of Alberta, Bernard Callebaut established his Chocolaterie Bernard Callebaut three decades ago. He was once Calgary’s king of chocolate. He led a small empire of confection retail stores, a vast distribution network and a well-loved brand. 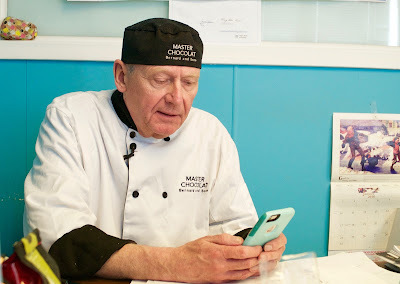 As a fifth generation Belgian chocolatier his 53,000 square foot chocolate factory absorbed a full building, and everybody had Callebaut chocolate for weddings, birthdays, and Christmas in western Canada. In 2010 things went wrong. Bernard's bids to hold on to his company failed. Not only did he lose recipes, trademarks and a brand he spent most of his life to build, he even lost the right to use his own name. While you can take everything away from a Producer, the one thing no one can take from him is his Passion. 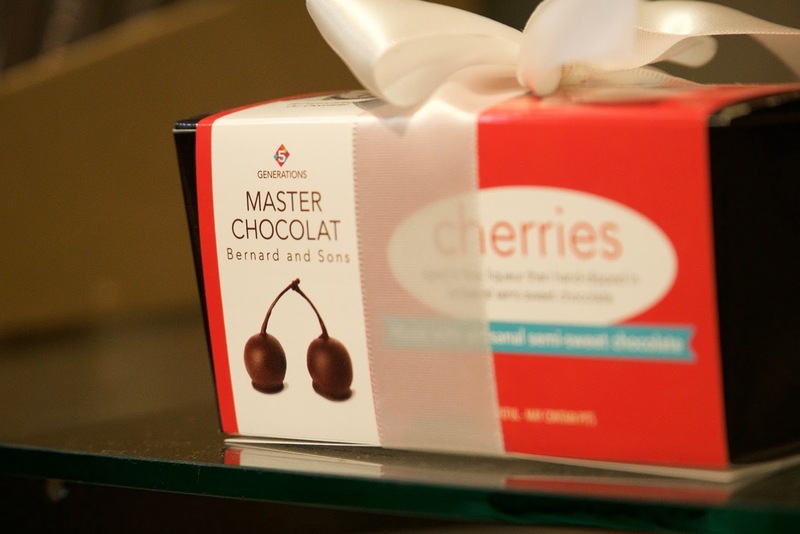 Bernard still has the same great love for the product than he's been making as a young entrepreneur chocolatier. He still has the same drive to show, tell and inspire people to taste his chocolate creations. Most of all, he still has his knowledge and skill to make chocolate taste great. No one can trademark, copyright, tax, permit, or take this away from him: Passion and knowledge are his, for good. 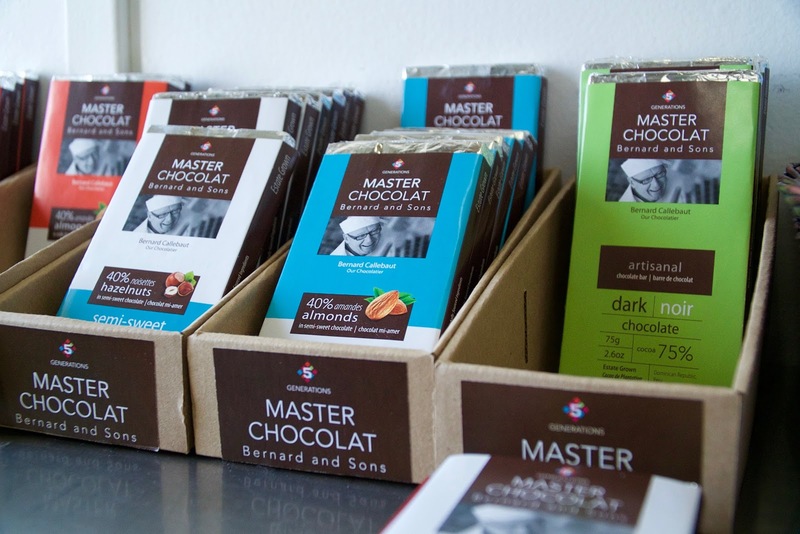 Winner for ‘Best Milk Chocolate Bar’ – 2013 International Chocolate Salon Awards in Los Angeles. 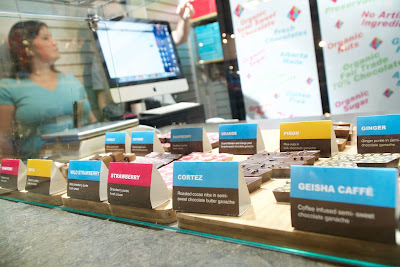 Winner for ‘Best Chocolate Boutique’ – 2013 Top Choice Awards in Calgary. Silver Award – 2015 International Academy of Chocolate Awards in London. Bernard was the first North American to be bestowed the honour of “l’Ordre Internationale de la Gastronomie Francaise”, recognized by the French Government for outstanding contribution to the culinary arts. As the founder of Chocolaterie Bernard Callebaut, he ran the organization for over 27 years. Today, the company doesn't even credit its heritage, or him as the founder. 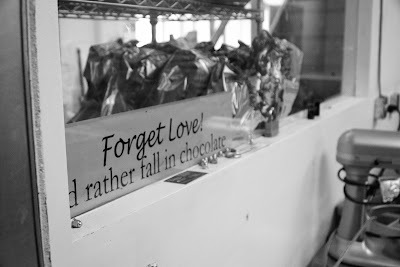 As Calgary’s very own father of chocolate, Bernard is still proud to present his offerings and newest creations. He does it now as Master Chocolat with a small stall at the market. He is a Producer at heart. He is still driven to make something of value, make it better, and share it with people that are interested in his creations. We find Bernard where he is most comfortable, at the counter of his little chocolate shop at the Calgary Farmers' Market, where he tells his customers about his greatest passion and shares it with anyone willing to stay a moment to listen and taste Bernard's Artisan Chocolate. "Starting over is a great opportunity to reinvent," Bernard affirmed. "It gives you a chance to try new things. I get to talk to my customers again, and try new recipes." Bernard shared his secret: The pleasure of seeing a person enjoy his chocolate is one of the biggest drivers that motivates Bernard to keep doing what he does." When we visited his small factory nearby, we found the same passion with his staff. Bernard shared a piece of chocolate with us that is a new recipe he's been working on. "This one is going to a competition in London. Who knows, maybe they'll like it?" Bernard exclaimed. It is almost unbelievable to meet a person with Bernard's lineage, background and stature in the world of chocolate. His story is even more amazing. To think that you can lose all you've accomplished, but still hang on to your passion and be proud of who you are and what you've accomplished. It is a privilege to know Bernard and tell a little bit of this phenomenal story. It is even more amazing to get to know a little more of the person of Bernard Callebaut. Not his chocolate, but the man with a passion for making good chocolate. This opportunity affirmed for us our own goal of why we should tell the world of our makers and the people that are creating our world: Our Producers. Not the Government. Not the Corporation. Not the Bank. But, these are the people that ultimately create our word. Governments come and go. Banks change and disappear. Some of them can even take your rights away to use their own name. But the one thing they can never take from you the producer is passion! This, Bernard has in spades. Thank you for this amazing opportunity, Bernard.